I can handle a bus being 15 minutes late. Heck, even a half hour late is tolerable. You know, it happens. But 40 minutes late is just unacceptable! That said, the 5:20 trip of the 90 from Wellington to Davis seemed to be cursed from the beginning: faulty destination boards, excessively beeping fare machines, horrible traffic on narrow roads, and getting stuck in snowbanks were all highlights of my ride. This is gonna be a long one. A bit blurry, but it was getting dark outside. We actually made it down Revere Beach Parkway, onto the Fellsway, and over the Mystic River without a hitch. Turning off soon after that, we let a few people on at Assembly Square, then continued down Assembly Square Drive. The Orange Line station was visible a few hundred feet away, but it was being replaced with shuttle buses. Unfortunately, Sullivan Square was a bit of a mess. There was quite a lot of traffic as we turned onto Broadway and attempted to get into the busway. It took a while, but we finally managed to make it in, pick people up, and loop around back to Broadway. Broadway was lined with businesses, but we soon turned onto Cross Street. This was a narrow residential street. It was fine at first, but at the intersection with Pearl Street there was a lot of traffic going the other way. The driver made her way across the intersection, but due to the traffic, parked cars, and huge snowbanks, we couldn't fit down the next portion of Cross Street. This resulted in the bus getting stuck in the middle of a busy intersection waiting for free space. Finally, someone gave us room to go by, and then we played the swerving game as we continued down Cross Street. After crossing over the Lowell Commuter Rail tracks, we prepared to make a right turn onto the McGrath Highway. There was lots of traffic, so we waited for an opening. When there was one, the driver attempted to accelerate onto the highway, but an unpleasant noise came out of the bus and we couldn't move. The driver kept trying to get the bus going, but as the noise persisted, I looked out the window to see a massive cloud of smoke coming from the back of the bus. Soon after, a disgusting smell filled the air, causing a few passengers to plug their noses in disgust. The driver decided to reverse the bus a bit, which caused all the lights to turn off. At this point, a few of the passengers were understandably fed up. They asked the driver if she would let them out, but didn't get the response they wanted. "I can't do that," the driver said, "it's a safety issue." So we basically just sat there for 10 minutes waiting for an opening in traffic while passengers continued to bug the driver. Finally, someone stopped for us, and the driver floored it. Slowly, but surely, we made it around the corner and onto the highway! "Thank you for your patience," the driver said as we stopped for another huge traffic jam. The 90 on Highland Ave - obviously not the same bus I took for this review. Soon we turned onto Highland Ave, going by the Somerville High School and Somerville City Hall. We passed some apartments, which soon turned into houses. Eventually, businesses started to make a presence in the neighborhood. Just before Davis Square and all its retail, we turned onto Grove Street, then into the Davis Station busway. Finally!!! And this one's even more obviously not my bus! I have to wonder why it looks so high up in the picture, though. Ridership: There were almost 55 people on my trip, but I did get it during the peak of the evening rush hour. That said, the 90 always seems to be busy when I take it, with about 30 people each on my other two rides. In actuality, the route's ridership is somewhat low overall, with about 1,200 riders per weekday, 700 per Saturday, and 400 per Sunday. On my ride, Wellington, Assembly, and Sullivan were the important boarding points, and people fed off the bus slowly after that. Pros: This is a theoretically fast link between the Red and Orange Lines. It also connects a lot of Somerville to Assembly Square, and serves the High School and City Hall, too. Cons: The schedule is really, really, bad. The route runs every 40 minutes rush hour, every 45 minutes during the day, and every 65 minutes nights and weekends. Plus, the route on Sunday only runs from 10:30 to 6:00. Also, even without the snow issue, that intersection with the McGrath Highway would've taken forever to traverse due to all the traffic and the route the bus has to take through it. Nearby and Noteworthy: There were businesses along Broadway and Davis Square is fantastic. Was I biased by all the problems the bus experienced? Probably. But is this still a bad route? Yes, it is. The schedule is terrible, and that one intersection is a mess. That said, it does serve a lot of Somerville and seems to be an important route, but unlike the 110, this schedule can't be salvaged. Actually you picked the wrong intersection to complain about. The intersection that isn't okay is the one right by Wellington, at the crossing of 16 and 28 (Revere Beach Pkwy and Fellsway). I have to traverse this intersection regularly by car making the same right turn as the 90 and it's a nightmare, it can get clogged for 5-10 minutes at a time and the bus is too large to cut through station landing. Just so the bus can go one stop further to Wellington. The schedule could be cut by 15-20 minutes per trip by just turning the bus around at assembly like the 92, or by creating a bus structure at the new assembly station. Because that station now provides a link between Wellington and Assembly I think there's no reason the 90 needs to continue on to Wellington. 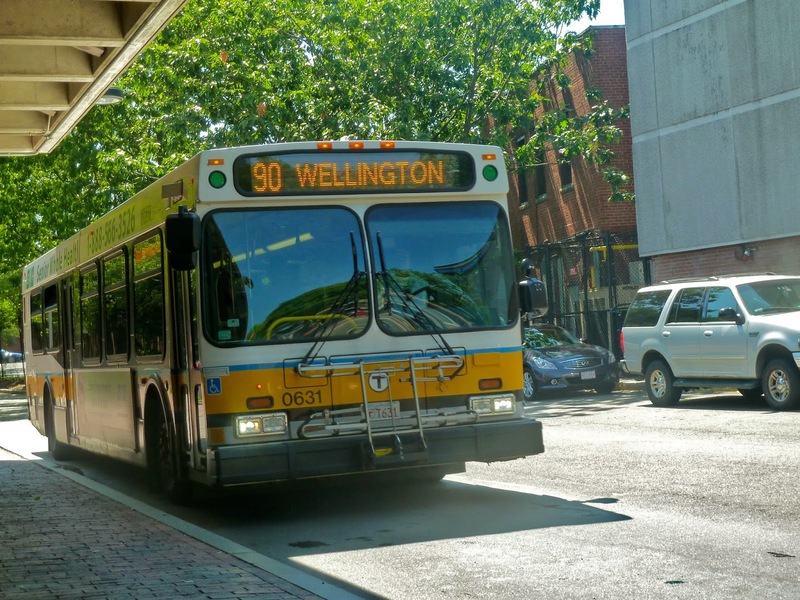 In my experience nobody ever takes the 90 to Wellington (why would you? its faster to get on the orange line in 99% of cases) but people do use it to get from Somerville or Sullivan to Assembly Square, as I have done on occasion. Everyone gets off at Assembly Square. The entrance on McGrath isn't usually a problem sans snow because of the way the traffic lights are set up, I think your adventure was quite unusual. Getting from McGrath onto Medford Street (which the 88 does also) is admittedly a pain, but its maybe an extra minute on average.